​Narwhals keep warm as they swim through icy Arctic waters thanks to their natural blubber insulation. These smiling narwhal slippers keep your feet warm thanks to integrated USB-powered heaters. Work on your computer as these cozy-looking flippered friends keep your toes toasty. Slip on the foot warmers, plug them into their shared USB cable, kick back, and relax in warmth! 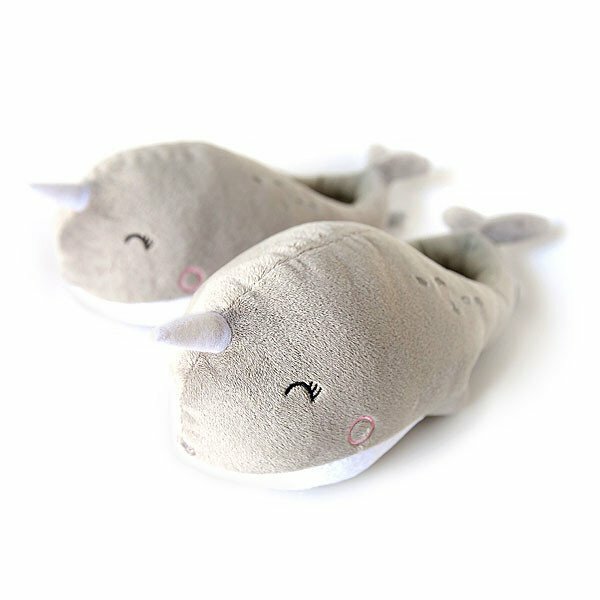 These Narwhal slippers are made of cozy cotton and polyester. Use the detachable USB cable to plug them into your Mac, PC, or other USB port. USB cable is 57" long so you can stretch out and still keep warm. One Size fits most, up to men's size 12.